The Sennheiser SC 70 USB MS Black Wired Headset is a dual wired headset that has a powerful and convenient in-line call control unit, where users can get access to specific call management functions, including Call Redial, Mic Mute, Volume Control, and Answer/End Call. With these functions right at the users’ fingertips, they can be assured that they get to enjoy and benefit from improved call handling and management, which can result to better productivity. 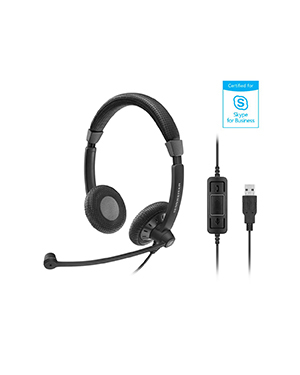 Sennheiser SC 70 USB MS Black Wired Headset is certified for Skype for Business. It has an excellent style and design, together with comfortable fit and incredible sound quality, making it perfect for office professionals. Get to know this headset better at Headsetsonline hotline: Australia wide 1300 131 133! Sennheiser is a leading German audio corporation that takes pride in delivering top-notch audio devices and solutions, from headphones, microphones, and telephony accessories to avionics headsets and their respective business and professional applications and solutions. It currently has several headquarters all over Germany, including Wedemark, Hanover, and Lower Saxony. Sennheiser was known as Lab W in the past, when it was just founded in the year 1945 by Dr. Fritz Sennheiser, along with seven other electrical engineers from University of Hannover. This audio electronics enterprise started just after the end of the war and relocated in the village of Wennebostel, where it got its name in the first place, Laboratorium Wennebostel, which is what Lab W really means. From Lab W, Sennheiser first developed and manufactured a voltmeter. Its offers expanded to microphones, geophysical equipment, misers, and headphones in the 1950s. It still continues to be the epitome of innovation and technology even after it introduced the very first open headphones of the world in 1968.